This Wednesday’s peek into my classroom is to highlight a very cool website at www.classtools.net. 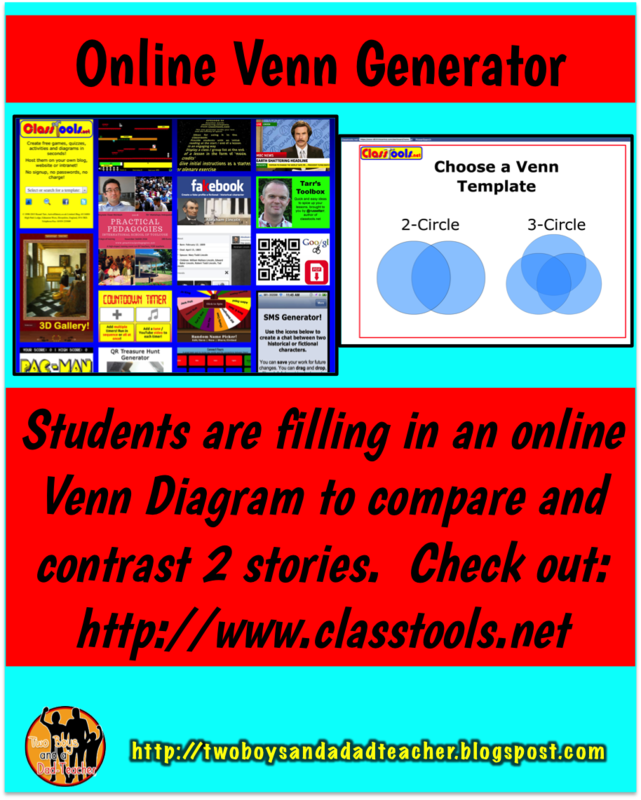 The site has many great tools for teachers to use online, including a Venn Diagram generator. Click on READ MORE below to read the rest of the post! This week my students are continuing to practice with RL.3.9 (compare and contrast themes, characters, settings by books by the same author). 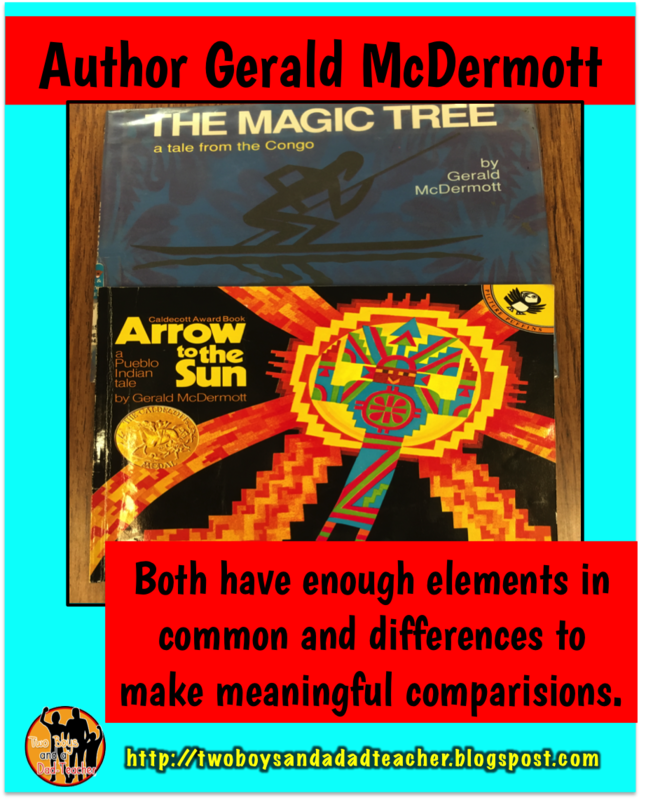 We used 2 stories written by one of my favorite authors, Gerald McDermott: Arrow to the Sun and The Magic Tree. They each had enough similarities and differences to easily compare and contrast. We first practice filling out a Venn Diagram on paper comparing the setting, main characters and the problem in each story. Then we used that information to write a paragraph that compared and contrasted the stories. Since we are getting nearer to the state standardized testing window of April and May, I decided that I wanted the students to practice entering information online into a chart or table. I Googled “online Venn Diagram” and discovered this wonderful site at www.classtools.net. It has an online Venn Diagram generator that is easy and intuitive to fill out. You give the diagram a name, fill in the labels and then type directly into teach bubble area. 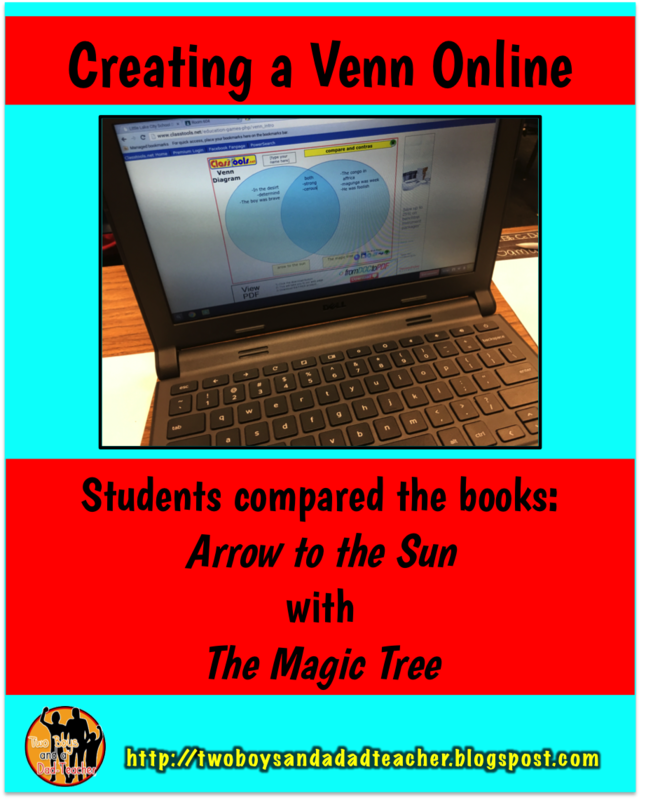 The students then took their completed written Venn Diagrams and used them to complete the online Venn Diagram. It did not take them long to complete. Our next step is to actually do the Venn Diagram online and then use that to write a paragraph to compare and contrast 2 stories.